The smart and efficient way to test network installations. Patch App & Go is the one man network tester & cable tracer, powered by your smartphone. Why send two men on site, or spend hours testing by yourself when you can just…..Patch App & Go! 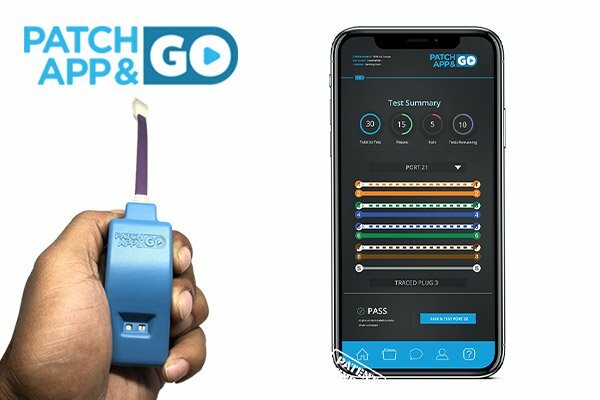 The Patch App & Go Continuity Tester and Cable Tracer is the one man device powered by any mobile device running on android or IOS. After downloading the app to your device, testing or tracing 4 pair Lan cables becomes a quick and easy process. Each Tester is supplied with 6 Smart Remote Plugs (with the option of buying more) which are individual programmed with numbers from 1 to 6. As you test the Patch App & Go will visually display a pass or fail, as well as confirming the unique ID of the smart plug currently being tested.